Forget media archetypes of older Millennials as college-educated singles living in cities. The typical 29-year-old is living with a partner in the suburbs—without a bachelor’s degree. What is the typical life experience for an American on the verge of turning 30? This is a hard question to answer, no matter who is asking. But it’s become especially difficult for an industry responsible with providing the answers: the national press. An irony of digital media is that the Internet distributes journalism, but it concentrates journalists. Jobs at media sites like The Atlantic, BuzzFeed, or Gawker are five-times more likely to be located in New York or Washington, D.C., than television-news jobs. The clustering force is only getting more centripetal: The share of reporting jobs in Los Angeles, NYC, and DC increased by 60 percent between 2004 and 2014. It’s easy to imagine many downsides of this agglomeration, like the dissolution of local reporting, but a subtler risk is that well-educated journalists in these dense cities wind up with a skewed impression of the world, a “majority illusion” based on the extremely unrepresentative cross-section of the country that’s immediately around them. To be fair, being a reporter in Des Moines or rural Nebraska, while it provides a better view of Des Moines and rural Nebraska, doesn’t offer a universal window into the average experiences of all Americans, either. For that, one needs something else, like a national survey. Instead, the average 29-year-old did not graduate from a four-year university, but she did start college; held several jobs, including more than two in the last three years; is not as likely to be married as her parents at this age, but is still likely to be living with somebody; is less likely to own a home than 15 years ago, but despite the story of urban renewal, is more likely to live outside of a dense urban area like Brooklyn or Washington, D.C. The average 29-year-old has not graduated from college. Instead, he’s completed “some college” but doesn’t have a bachelor’s degree. Although about one-third of whites in this age cohort have a four-year degree, four out of five black and Hispanic 29-year-olds don’t. Perhaps the most surprising statistic is the huge diploma gap opening between men and women about to turn 30. Millennial men earn more than women their age, but by 29, one-third of women received a bachelor’s degree, compared with just about one-quarter of men. The median income at 29 is about $35,000. Talk of a steady “career” for most young people is more aspirational than descriptive. Jobs are still temporary for twentysomethings. The average American has had more than seven jobs before she turns 29, and a third of them lasted less than six months. One might assume that job-hopping and short-term employment is just a part of being a teenager. But Americans at all levels of education held an average of more than two jobs between ages 25 and 28. The challenge of temporary employment is worse for young people without a high-school or college diploma. The typical length of a job for a high-school dropout between 18 and 28 is only six months. The marriage story is complicated. On the one hand, young people are getting married and having children later than their parents, or not at all. In 1960, 84 percent of 25-29-year-olds were married; by 2010 just 42 percent were, a 50 percent decline. As the graph above shows, the percentage of Millennials married with kids has fallen steadily since 1970s. But that doesn’t mean most 29-year-olds are single. In fact, 60 percent of them are either married (40 percent) or living full-time with a partner, or “cohabitating” (20 percent). Perhaps it’s most accurate to say that being single at this age has become more common, but being “attached” has become more complicated, particularly for minorities. At 29, white college graduates are more than twice as likely to be married than blacks who didn't graduate from college. At the turn of the century, it wasn’t a stretch to say that the typical 29-year-old was a homeowner, since 44 percent of this age group owned a house. 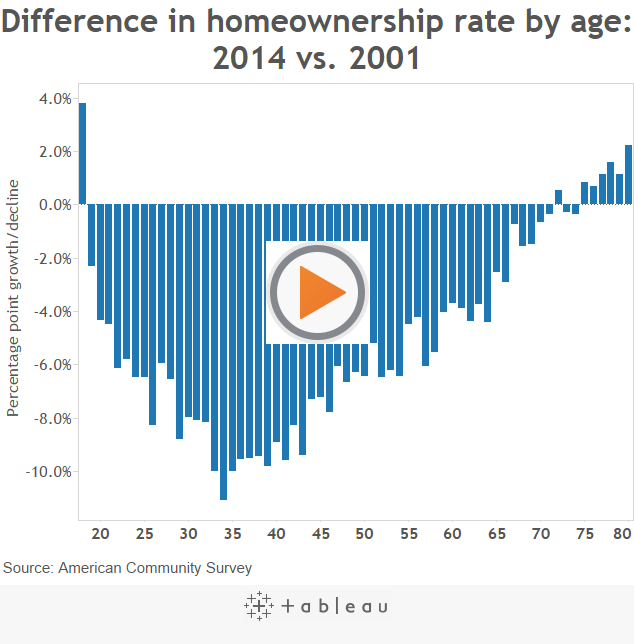 But just about every cohort in the U.S. is less likely to own a home now than they were 15 years ago, as the graph above shows. Today, just 35 percent of 29-year-olds are homeowners. Although the Millennial stereotype assumes otherwise, they’re not all clustering in dense urban neighborhoods. A combination of low incomes and urban housing shortages (and perhaps an independent preference for space and sun) is pushing more of them out to the suburbs. As Ben Casselman of FiveThirtyEight reported, for every 100 American between 25 and 29 moving to a dense city, 124 are moving from cities to the suburbs. Suburbs come in many shapes, from isolated cul de sacs branching off highways to relatively dense and walkable neighborhoods. But it’s safe to say, at least, that when it comes to geography, it’s particularly difficult to talk about a “typical” 29-year-old. This raises an important final point. Although it’s useful for journalists, policymakers, and just about anybody to have an accurate sense of the average experience of somebody their age in America, “average” is easy. It’s a memorizable number, or a factoid. More important is to appreciate the diversity of experience, to see that groups like “college-educated at 29,” “living in a city at 29,” or “married at 29” all leave out more than 60 percent of the age group. Nothing is “normal,” really, least of all a college-educated young person living in a coastal-metro apartment.